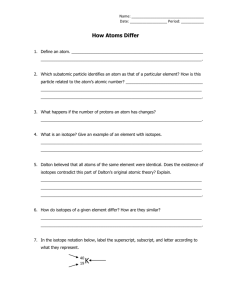 Students will be able to define the terms isotope and average atomic mass. 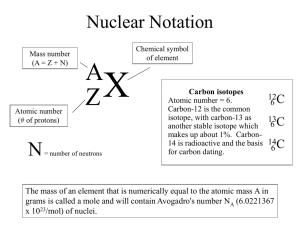 Students will be able to use correctly isotope notation to represent an isotope. 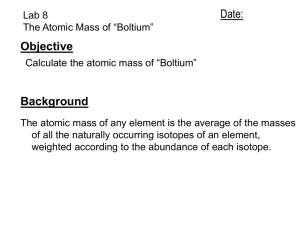 representative sample of different isotopes and their atomic masses. data and developing reasonable scientific explanations. There are no significant safety concerns associated with this activity. isotope, contains one proton and two neutrons in its nucleus. found in each Bag O’ Isotopes. 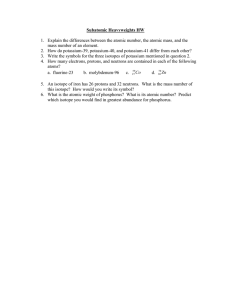 Students should follow directions outlined in the attached Bag O’ Isotopes student handout. 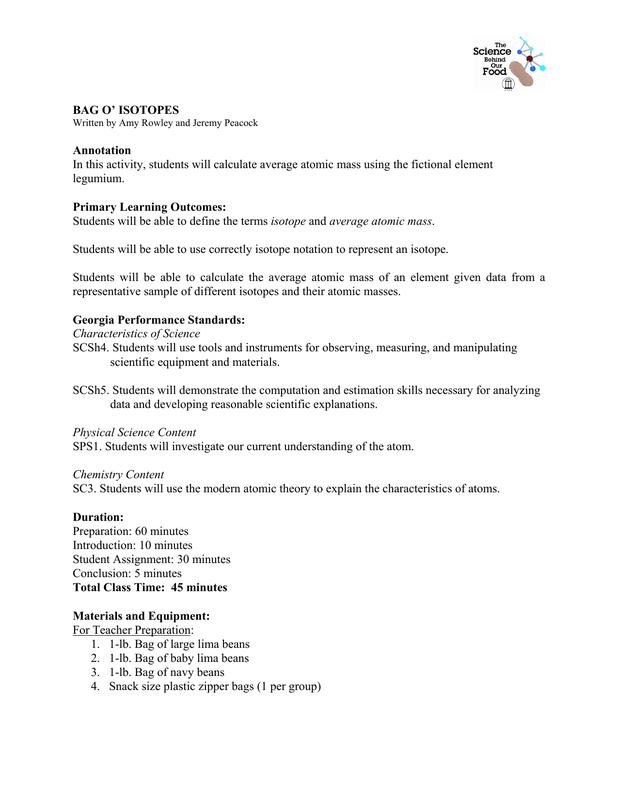 Assessment should be based on completion of the Bag O’ Isotopes student handout. has an atomic mass of 6 amu. but different numbers of ____________. as they are found in nature. Isotope notation includes _______________, _______________, and _______________. 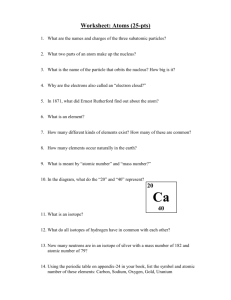 To calculate the average atomic mass of the newly discovered element, legumium (Lg). 1. Count and record in the data table the total number of isotopes in the sample. 2. 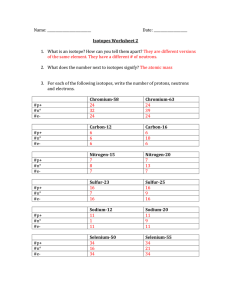 Count and record in the data table the number of each legumium isotope. 4. 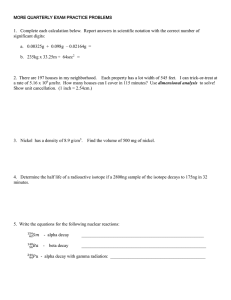 Calculate the average atomic mass of legumium using the following equation. 1. 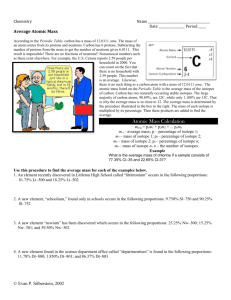 For each legumium isotope, give the proper isotope notation. 2. 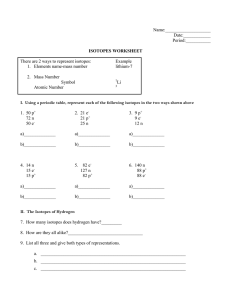 Calculate the number of neutrons in each legumium isotope. 3. According to the sample, which legumium isotope is most abundant in nature? atomic mass of legumium be affected? 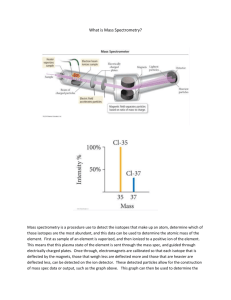 Subatomic Heavyweights HW mass number of an element.